According to Pantone “Living Coral” the color of the year for 2019, “embraces us with warmth and nourishment to provide comfort and buoyancy in our continually shifting environment”. 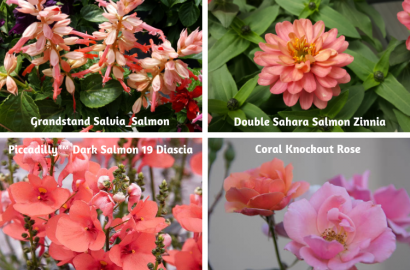 This selection was not a surprise as I noticed many new and improved coral themed plant varieties at the 2018 California Spring Trials. Coral can add excitement to your garden and it also compliments other colors, like blue, purple, and white. Grandstand Salmon Salvia – This annual is compact growing to a height of 12 to 14 inches. It is perfectly suited for planting in 8-inch and larger containers. This salvia will continuously bloom from late spring/early summer until autumn frost. It prefers full sun to partial shade. The plant will hold up in hot, humid climates. It is also a pollinator-friendly plant, especially loved by hummingbirds and butterflies. 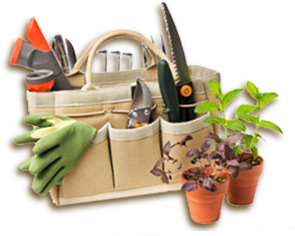 Use well-drained soil and keep the soil moderately moist at all times. 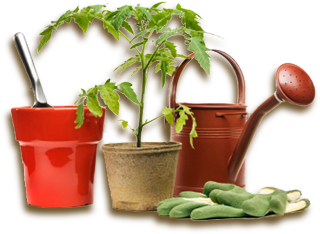 Hardiness zones 9 – 11. Double Sahara Salmon Zinnia – Coral is a new addition to this zinnia family. This annual flower will bloom from spring through autumn. The color of the flower will stand up to the hottest conditions, while others in this color class will fade out. This double-flowered zinnia is also disease resistant and should be planted in full sun in moist, well-drained soil. This flower looks great in containers, is drought tolerant and will not need to be deadheaded. Coral Knockout Rose - Coral is a new color addition to The Knock Out® Family of Roses. This dependable rose starts out orange and fades to coral and it blooms from spring through fall. In hot, humid climates, the coral color becomes even more intense. The initial foliage is bronze-red and becomes green. This rose is hardy for zones 5 – 11. Piccadilly™ Dark Salmon 19 Diascia - This new variety of Diascia has alluring blooms similar to snapdragon flowers. This new variety has been bred for extended color during cooler spring weather. It is typically grown as an annual but in some areas, it can be considered a perennial. This plant is low-maintenance and once established it is drought tolerant. It is a great plant for containers. MixMaster Peaches and Cream Calibrachoa – Calibrachoa are one of our favorite annual flowers. This new variety is an eye-pleasing mix of coral, orange, and white flowers and its petite blossom resemble a petunia. Its trailing habit makes it perfect for hanging baskets and containers. Calibrachoa are hardy in zones 9 – 11 and are fairly easy to grow. They prefer organically rich soil and moist but well-drained and a location that gets full sun. Pyromania™ Hot and Cold (Red Hot Poker) – From Proven Winners, will bring some drama to your garden! The spiky flowers on this perennial go from tangerine orange to white. They grow from 30-36 inches in height and will bloom all summer long. Red Hot Poker grows best in well-drained soil, and this plant is hardy for zones 5 –9. In zones, 5 – 6, protect these plants with mulch in the winter. Dreamscape™ Salmon Eye Cyclamen – This new variety has heart-shaped salmon flowers that sit above attractive dark green foliage. This is a unique color for outdoor cyclamen. Cyclamen is an annual that prefers full sun to partial shade. This variety is compact and will do well planted in a container. Let the plant dry out a bit between waterings. Cyclamen bloom from fall into early spring. Coral Fountain Amaranthus – This pretty annual flower is also known as tassel flower and its tassels are a beautiful shade of coral-pink. Amaranthus make a unique accent plant and look great in dried flower arrangements. The long, rope-like flowers can be grown so they can cascade over the side of a planter. Amaranthus prefer partial shade to full sun and well-drained soil. You can buy the seeds here. Lewisia CONSTANT™ Coral – I recently learned this plant was named for the explorer Lewis Meriwether, who discovered this pretty plant during his exploration of the Louisiana Purchase. It is the state flower for Montana and is also called Bitterroot. It has been propagated to better tolerate the heat and the pretty flower continually blooms from spring to fall. The 6 – 8” rosettes have fleshy almost succulent type leaves and it is easy to grow in a location garden with good drainage. It can even be grown in a rock wall and is well suited for xeriscaping. 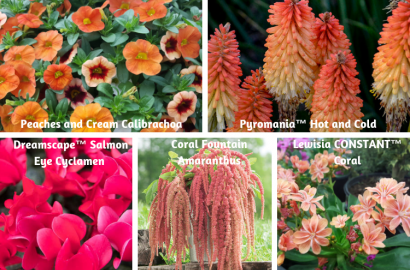 If you haven’t finished your plans consider adding some coral flowers to your garden this year. If you have any favorite coral flowers, let us know.